Steven Cushner did the same thing over and over again, until he didn’t. The Washington artist made paintings — some small, some medium-size — with bold, symmetrical, repetitive patterns, utilizing rote gestures to evoke forms both natural and man-made. Cushner did this for decades. Then, last month, he decided to do something new. “I wanted to do a painting that I didn’t know how to do,” he says. He didn’t know how to paint big. But now Cushner is working on his biggest canvas ever, and it’s visible to the public from a storefront window at 1700 L St. NW. Through an arrangement with developer the Lenkin Company and gallery owner George Hemphill, who represents his work, Cushner fashioned a studio out of the commercial space early this month, and he’ll continue working there through Dec. 31. For this latest work, Cushner, 60, was inspired by the artists who influenced him as a young painter, such as Sam Gilliam and his grand draped canvases, as well as by a recent trip to Madrid, where he saw Picasso’s 11-by-25-foot masterpiece “Guernica.” His Brookland studio wasn’t big enough to accommodate his new painting, which is 12 feet tall and 30 feet wide, so he sought out the larger space, where Cushner also is working on two wall-size paintings, which are small only by comparison. 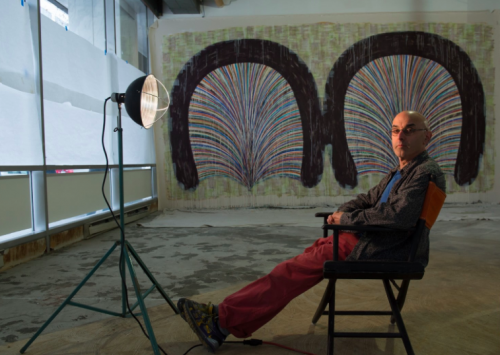 All three works explore the symmetrical reverberations from a central point or shape, with the goal, he says, of capturing the physical motion required to make them. The painting is not the only thing that has taken on a grander scale. With each enormous brushstroke, Cushner has been examining his process, his ambition, his entire career. The canvas might be big, but its significance is even bigger. In a lot of ways, the painting —and the space — contributes to a sense of starting over. After years in his studio, where Cushner has been fighting lethargy, familiarity and occasional boredom, the newness of this space has been jarring. That self-consciousness is why passersby can see Cushner’s work only at night, when the white paper covering the windows comes down and the paintings, illuminated by work lamps, glow from within. But George Hemphill had another idea. He persuaded Cushner to take down the paper when he wasn’t working, to give people a chance to track the progress of the paintings. What he’s doing in there? Learning. Wearing paint-splattered jeans with holes in the knees. Listening to the Ramones. Climbing up and down a ladder every couple of minutes to see what the painting looks like from afar. He’s trying, and sometimes failing. He may never find it. And if he does, and the painting succeeds, he has no idea where it will end up. Perhaps even in the trash.